Northern BC’s premier mixed martial art academy located in Prince George BC. Curriculum consists of a structured system instructed by certified black belts, boxing and wrestling coaches. At Kaiten MMA, we believe in cultivating a team environment where everyone helps and supports each other in the learning process using strong fundamentals. Check back at our page for news and discussions regarding all of your local, national and international MMA events and news. Keep your head up, chin up, eyes open and have fun! Haven’t you ALWAYS Wanted SKILLS like THESE? A modern approach to a new world. Offers real world defensive tactics designed to quickly develop your ability to protect yourself and your loved ones. A MMA combination of the best of Muay Thai, Boxing, Taekwondo. Kicking, punching, elbows and knees, hybrid Martial arts. If you would like to sculpt your entire body; boost your metabolism; lose fat; and have fun while learning an exhilarating new skill. These are all the benefits of training Martial arts which while de-stressing, one is; making friends, building confidence, and merging body, mind and spirit. It is truly a great way to enrich the quality of your life and invest in your health and well being. and much, much more! Our Submission Grappling and Brazilian Jiu Jitsu Program will help you develop your ground game for either self-defense or for competition (your choice!). Karmjeet Manhas was tested to Brown Belt by Don Whitlefield and is one of the Northern Affiliates of Westcoast Martial arts Association. 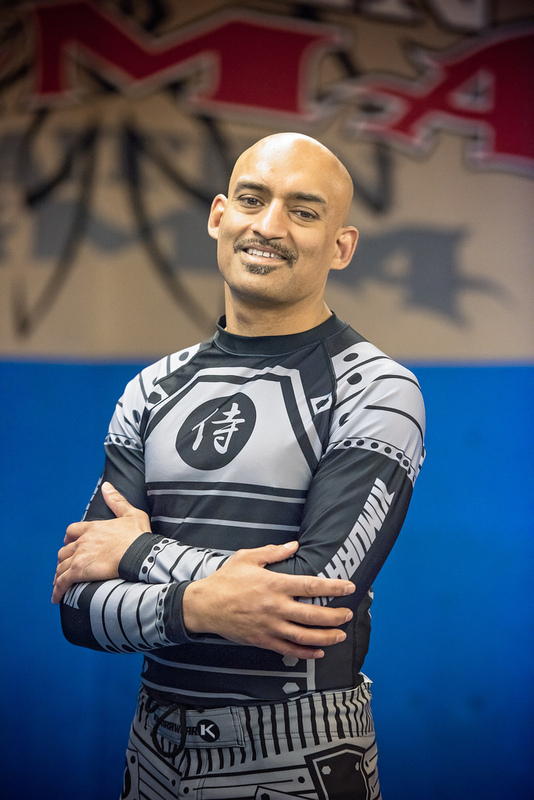 Karm started off his cross-training including brazilian juijitsu from Murray Sholty and trained across Western Canada with many different teams and clubs including, Kamloops, Calgary, Edmonton and beyond while working while travelling alongside and under several UFC and Pride FC athletes . Karmjeet recieved his blue belt from Kyle Cardinal BJJ schools who is a Black Belt BJJ under world BJJ champion, Rodiguo Mundiraca from Winnipeg Manitoba. Mr Cardinal is also one of the most experienced referees in Canada boasting over 700 MMA matches officiated including the UFC. plus over 15 years of Mixed martial arts experience such as the self defence style of Jute Keen do. Mr Manhas owned his first Taekwondo school in 2001 and has trained/ competed/coached for almost 20 years of experience.